Crispy on the outside, soft on the inside. These baked potatoes will have everybody coming back for seconds. Lay parchment paper on a cookie sheet. Wash and dry potatoes. (New Gold potatoes have very thin skins that are perfect for crisping). Place a wooden spoon handle lengthwise beside each potato. 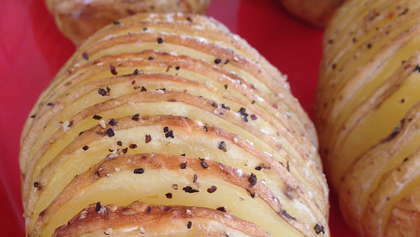 Carefully slice through each potato forming thin "chips" stopping at the depth of the spoon. (This will keep the bottom of the potato in tact). Place potatoes on parchment paper. Using a pastry brush, spread each potato with olive oil. Generously season each potato with salt and pepper. Bake for 1 hour until cooked through. Brush another layer of olive oil, salt, and pepper on top. For crispy potatoes, set oven to broil. While carefully watching, broil potatoes until tops are crispy. Remove when desired browning is reached.